For Wilson, two men – Vladimir Putin and Viktor Yanukovych – bear the main brunt of responsibility for Ukraine’s crisis. As Leo Tolstoy famously quipped, had Napoleon’s cold on the day of the battle of Borodino really affected the course of war then the valet who failed to bring him his waterproof boots should have been the saviour of Russia. There are few saviours in Wilson’s book (partially because the battle for Ukraine is not over), but plenty of attention to quirks of history and the idiosyncrasies of individual actors. For Wilson, two men – Vladimir Putin and Viktor Yanukovych – bear the main brunt of responsibility for Ukraine’s crisis. Yanukovych set the stage by violating all the formal and informal rules of Ukrainian politics in his efforts to maximise personal power and wealth. He single-handedly dismantled constitutional checks on his formal powers, jailed his political opponents and built a mafia-style system based on Don Corleone’s rules. Wilson details all the corrupt schemes meant to benefit Yanukovych’s family, and contrasts it with a more decentralised corruption under his predecessors when each oligarch could expect his ‘fair share.’ It was his personal greed above anything else that, for Wilson, explains his self-defeating policies. Yanukovych built a mafia-style system based on Don Corleone’s rules. The second man emerged into the limelight in the next act of Ukraine’s drama, although Wilson clearly believes Putin had long been standing in the shadows and preparing to make his move. Meanwhile, he promoted a peculiar breed of conservative and nationalist values disseminated across a geographical chimera of the Russian World (or the Kremlin World as Wilson calls it). His eager recruits from among pro-Russia parties and Russia-friendly NGOs in Ukraine became the new warriors in the Kremlin’s ‘information battles.’ When Yanukovych’s regime began to unravel along with the fractured Ukrainian state, Putin acted with urgency and determination to exploit the new vacuum. Still, Wilson sees Putin’s land grab in Crimea more as political opportunism than the outcome of a long-term strategy. The success of another revolution in Ukraine threatened the stability of Putin’s own rule, so he had to deny the rebellious nation its victory, at any cost. It was ultimately his political survival rather than grand imperial ambitions that motivated his new military adventure. Other powerful causal forces in Wilson’s account are historical contingency and individual miscalculations. A fateful decision to forcefully disband a handful of protesters remaining on the Maidan on the morning of 30 November resulted from Yanukovych’s belief that they were all paid to be there – just as demonstrators participating in the prior rallies of the Party of Regions had been paid. If they had acted as expected, when the police force advanced they should have just run away never to return. Instead, to the surprise of the ruling clique, they showed up in much larger numbers a day later. But Wilson believes Yanukovych could have survived the crisis had he been patient enough to ‘sit out the protests.’ But he made another mistake of anxiously ‘moving first’ even as they started losing steam. His ‘dictatorship laws’ provoked a violent uprising, which ultimately put him in a corner. Wilson, however, rejects the notion that protesters who started a violent assault on the police barricades on 19 January were government provocateurs. Regular protesters were in fact ‘outflanking’ both the moderate and the nationalist opposition parties, and seeking ‘a more direct action’ in their confrontation with the police. The end result of the opposition leaders’ anaemic authority was mayhem and bloodshed on Kyiv’s streets. The success of another revolution in Ukraine threatened the stability of Putin’s own rule. Given the importance attributed in the book to rank-and-file protesters, it is surprising how little space Wilson devotes to the discussion of protests spreading to the regions. He spends less than a page describing protest actions in other parts of Ukraine, when the majority of protests in the last month of Euromaidan actually happened outside Kyiv. Even more important was the protesters’ tactic of breaking into government buildings in regional centres and contesting the power of the local authorities appointed by the president. These actions involved a new ritual of coercive resignations of the local Kyiv-appointed governments, which was often carried out in a humiliating way in front of a large and cheering crowd. In one such instance in Lutsk a governor was handcuffed to a pole and put on his knees on a public stage for refusing to resign. This new ritual symbolised the breakdown of the central government’s authority in the regions, under the control of ‘people power,’ but it also proved detrimental to the Ukrainian state. It triggered the process of state fragmentation, which was accompanied by the defection of the local law-enforcement authorities to the side of protesters. By February, Yanukovych had not only lost control over parts of the capital, but over most of Central and Western Ukraine. This put him in a particularly weak position when violence in Kyiv escalated. 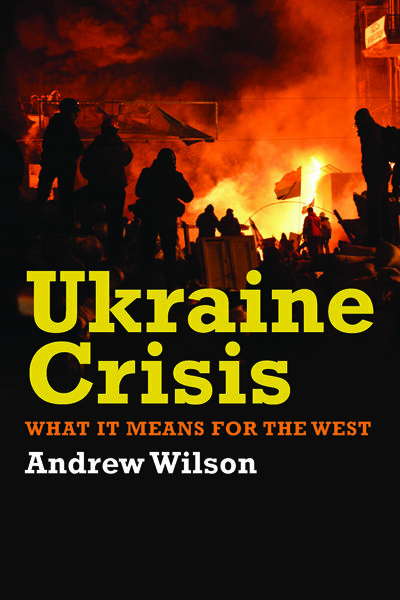 Wilson makes it clear that the outcome of Ukraine’s revolution was decided not at the round-tables or in posh offices of Ukrainian oligarchs, but on the Maidan where ‘two opposing armies faced off, throwing missiles at each other.’ He dismisses the argument that the defection of the oligarchs or the crumbling of Yanukovych’s party preceded the collapse of the regime – ‘they defected late, as part of the general panic, but they did not induce that panic.’ Their flight began as the limits of the capacity of the ruling regime to disperse the Maidan protesters became clear to everyone, including Yanukovych. This shift in elite perceptions would not have happened, had protesters not taken up arms. As Wilson argues, the tide turned only when regime defenders realised that ‘the opposition might soon out-gun them.’ But this makes his further claim that ‘Yanukovych was not in any immediate danger, on 21 February when he decided to flee Kyiv, somewhat puzzling. Why should Yanukovych not fear for his safety given that protesters had already killed or wounded close to 200 policemen; and opposition leaders proved incapable of restraining the crowd? The president’s insecurity should have been particularly felt given that he had just surrendered most of his presidential powers to the now opposition-controlled parliament, which immediately dismissed his crony at the helm of the Interior Ministry. In fact, Yanukovych had no other option but to ‘run away from the deal’ with the opposition, but his subsequent flight to Russia was not preordained. As Wilson notes, it was his rejection by former loyalists in the East, like Mykhailo Dobkin and Rinat Akhmetov, which prevented him from trying to rule from Kharkiv or Donetsk, and led him straight into Moscow’s hands. This highly contingent outcome, of course, had far-reaching repercussions. The Crimean annexation and war in the Donbas, in Wilson’s account, resulted from a confluence of factors, including the reluctance of the new Ukrainian government to respond forcefully to the first signs of Russia’s military presence in the peninsula. However, as the book makes clear, while the campaign to separate Crimea was run largely from Moscow, the secessionist movement in Donbas started as an internal operation, which rested on Yanukovych’s and Akhmetov’s patronage networks. Wilson claims that Yanukovych’s son ‘channelled in most of the money,’ and his managers organised first pro-Russia rallies, while local officials and law-enforcement bodies cooperated because they owed their position to the ‘Family’ or were intimidated by it. Akhmetov, by contrast, expected to use the secessionist movement as a bargaining chip in his dealing with the new government in Kyiv. Russian clandestine military groups led by Igor Strelkov and Aleksandr Borodai moved in only after Yanukovych and Akhmetov had prepared the groundwork. Wilson recognises the significance of local residents’ acceptance, if not necessarily enthusiastic embrace, of the secessionist plans in explaining the Donbas conflict. As he notes, ‘if it wasn’t for the passive-aggressive Donbas, the vote [in the referendum for Donbas independence] would not have taken place at all.’ He even goes as far as comparing it to the ‘peasants’ revolt’ driven by the ‘revenge of the ordinary folk’ even though hardly any peasants participated in the insurgency. Wilson’s account creates an impression that local residents in Donbas have been mere chess pieces moved around by the powerful behind-the-scenes players. While people on Maidan, in Wilson’s story, were pro-active movers of history, people in the Donbas have been mainly following their herdsmen. The entire war, as he sees it, is more the result of Russia’s manipulation of reality with passive locals fighting imaginary enemies. He does not address the reasons for a genuine alienation of many locals, both in Crimea and in the Donbas, from Ukraine’s nation-building project. Nor does he dwell on the emotional response of the locals to Euromaidan protests and the violent ousting of Yanukovych. There is also no attempt to understand their motives in taking up arms and risking their lives to challenge the Ukrainian state. The entire war, as he sees it, is the result of Russia’s manipulation of reality with zombified locals fighting imaginary enemies. Instead, Wilson paints a crude caricature of local rebels ‘fighting for Russian money’ and then spending it all on booze: ‘Cash arrived on a Monday, and was spent by Wednesday. Everyone was drunk until then. Then they did some fighting with Kyiv forces before the whole cycle started again.’ He cites the reports of human rights groups criticising rebel abuses, and yet he omits mentioning similar widespread abuses committed by the Ukrainian paramilitary battalions. Apart from citing various estimates of the death toll in the conflict, Wilson does not discuss the extent of civilian suffering caused by the use of indiscriminate weaponry. The tragic mass killings of civilians in Stanytsia Luhanska, Snizhne or Horlivka as a result of air strikes or artillery shelling merit no mention in his book, neither does the mass riot in Odessa, which led to the death of dozens of pro-Russia activists burnt alive on Kulikovo field. His chapter on ‘Eastern imbroglio’ exposes the two key weaknesses of an otherwise skillfully written and often insightful account of Ukraine’s turbulent recent history. First, this is not the book of an objective observer seeking to explain a major political upheaval based on a broad range of sources. Instead, parts of it read as a story presented by someone from the midst of the Euromaidan movement, which leads to many glaring omissions or misrepresentations. The second, and interrelated, weakness is Wilson’s uncritical acceptance of many rumours or allegations based on questionable sources, but fitting his overall narrative. His detailed account of the FSB preparing the snipers’ massacre of protesters on the Maidan is based solely on the claims of a new SBU [Ukrainian security service] chief. He takes at face value the Kyiv parliamentary commission’s claim that the Kyiv office of the Party of Regions was put to the torch by undercover SBU agents. And his claim that the Yanukovych family funded the uprising in Donbas is based on interviews with an unnamed Ukrainian security official and pro-Ukrainian activists from the Donbas – hardly unbiased sources. He similarly retells rumours that Yanukovych’s family or other oligarchs have funded extreme nationalists in the Right Sector party – an allegation, which has never been corroborated. While cognisant of ‘disinformation wars,’ Wilson is perhaps too eager to repeat many unverified and one-sided claims. As the first telling of a very complex story, Wilson’s book may certainly suffice. However, it is far from being an exhaustive and balanced treatment of the worst political crisis in Ukraine’s history as an independent state. Wilson himself acknowledges that the crisis is far from over and the future of a unified Ukrainian state is hardly secure. Given that many of the same corrupt elites and practices remain intact while the war in the Donbas rages on, the definitive account of the Euromaidan revolution and its fallout is yet to be written.